Ironbind Barrow is a Nordic ruin which contains a word wall for the Become Ethereal shout, and the tomb of a long dead warlord. The barrow contains one interior zone, Ironbind Barrow, and two exterior zones, Salma and Beem-ja's camp, and Ironbind Overlook. The path to the barrow is a short distance along the path east from Nightgate Inn. Just before the left-hand path to Wayward Pass, is a dirt path that cuts back to the northwest. There are two stone pillars, one having fallen over, and leaning against the other. There are two snowberry plants along the path, and a corundum ore vein, to the left along the rock face from the last stone pillar. When you pass under the arch, turn right, head up the stairs, turn around, and head over the arch; there is a random potion, and a chest lying in wait. Now head over to the camp, where the adventurers Salma and Beem-Ja wait. They are wary of their own limited combat skills and are deliberating over whether to tempt fate anyway. Once you arrive, they become more willing to enter the barrow. Salma: "How can you just sit here and wait? We should be in there!" Beem-Ja: "We must gather our strength. Who knows what's inside?" Salma: "Treasure, that's what! Get off your scaly rump and let's go." Beem-Ja: "Hush, Salma. We aren't alone." You cannot enter the barrow without them; if you enter without agreeing to accompany them, they will join you regardless. Salma's plan is simple, "Let's clear the place out first. Then we'll gather our loot." This means that they charge headlong into the barrow, not waiting for you. They cannot be killed by the enemies in the barrow, but they do ensure that this is one place where it is pointless to try and sneak up on enemies. They do not rush too far ahead of you, but instead wait after sections for you to catch up, before heading off once again. The tunnel you enter into is frozen. There are two frostbite spiders around the corner, but they won't detect you until you move forward. There is also a silver ore vein around the corner, by the far wall. Down the tunnel are another two frostbite spiders. There are eleven spider's eggs lying in this chamber, and a web sac hanging from the wall to the right. The next chamber holds a giant frostbite spider; it is on a ledge at the back of the chamber, but quickly makes its way down to attack you. There is nothing else to loot here. "This is it. We've found Gathrik's tomb." The path continues northwest, and opens up to reveal a hidden Nordic ruin, named Gathrik's tomb. Climb the rubble to the left as you emerge, and you will find a moonstone ore vein. Ascend the stairs and enter the well-lit area, where there is a grate blocking your path. To the right is a chest in an alcove, and in an alcove to the left there is a handle, which, when pulled, raises the grate. There are two draugr in the next room, both inside sarcophagi. If you enter the room just enough for your fellow adventurers to move, they will continue onward, not alerting the draugr. Once you have reached the grating in the middle of the room, the draugr will emerge and start looking for you. Facing west when on the grate there is an unlocked chest under the bottom of the wall. To the left of the grate is a leveled potion of defense. On the table opposite the entrance, there is a hide shield, a scaled helmet, a leveled strength potion, a potion of minor healing, and some wine. Follow the path as it cuts back, until you see a chest. There is a skeever here, and two more along the path to the right. There is a pressure plate in front of the chest, which activates a spear trap from the left-hand wall. Beside the chest is a leveled helmet. 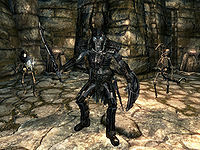 After the two skeevers, the path opens to a room with two draugr, one on the same level who will come charging at you, and another on the lower level, who is an archer. Cross the bridge, and search the shelves for three potions of minor healing. The shelves to the right hold a piece of leather, leather strips, and a random leveled potion. There is another piece of leather, a jewel, a leveled soul gem, and an iron shield, on the table to the left of the shelves. To the right is an adept-locked chest. Follow the path through the gate below until you reach a room with a large fire. There are two draugr here. In the rubble on the other side of the room there is a potion of minor healing, and a potion of health. To the left of the double doors, themselves situated to the east of the fire, is a set of shelves, which contain a potion of healing, and a random potion. 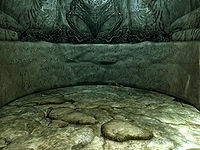 There is also a chain to the upper right of the fire; this opens the grate in the floor from the room with the first two draugr encountered in the barrow. A few skeletal remains fall down, and anything you may have left on the grate. Through the double doors is a corridor which is similar to the corridors found before puzzle doors. There is a randomly enchanted leveled helmet on a pedestal. Be careful when retrieving this helmet, because once it is removed from the pedestal, spears will shoot up from holes all around the base of the pedestal, and some more from above. Removing the helmet lets the gate blocking your progress lift, but there is also a chain hanging above you that activates the gate, if you don't feel confident of evading the spears. There is also a lever that activates the gate on the other side, which you can use to close the gate behind yourself. "This is it! Gathrik awaits us!" Around the corner is an iron door which opens to the main chamber of the barrow. Three skeletons and Warlord Gathrik wait to pounce on unwary, unprepared adventurers. On the walkways either side of the room, archer skeletons patrol, while a mage skeleton is down the stairs. Warlord Gathrik sits in his throne, opposite the entrance, but facing away. Gathrik's throne actually faces a word wall, which holds a word for the dragon shout, Become Ethereal. There is a chest to the left of the word wall, and around the back of the throne there is the unique weapon, Steel Battleaxe of Fiery Souls, a leveled shield, and two leveled potions; one potion of the healer, and one potion of strength. There is a gate to the east at the bottom of the stairs; a chain to the right opens it. There is also a soul gem, a leveled sword and a satchel to the left, on the floor. Follow the winding stairs all the way up, and locate the door to the overlook. 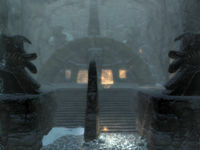 This is an exterior zone; open the door by raising the bar to reveal a landscape view of Winterhold to the north, and the Pale to the southwest. There is a chest that can be looted to your left. 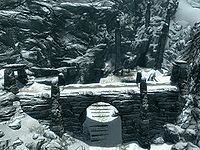 If you follow the "path" eastward up the mountain (toward the dragon lair marker on your compass), you should come across a small Dwemer ruin. It is guarded by two ice wraiths. All that remains are three pillars, and on top of the middle pillar is a collection of random potions and poisons. There are two chests and a random warhammer at the base of the pillar. Slightly north of the pillars is a quicksilver ore vein. Beem-Ja may appear without his clothes when he enters the barrow. The helmet trap that opens the door only reacts to direct interactions. If you shoot the helmet off the pedestal with an arrow, the door will not open. You'll have to place something else there and pick it up to be able to continue, or just jump onto the pedestal yourself to trigger it. Sometimes, the Steel Battleaxe of Fiery Souls and the shield will be hovering in the air. This is caused when you are of a high enough level for Warlord Gathrik to be a dragon priest. When he gets off the throne, these items will be thrown into space. Shooting the axe with an arrow or spell should cause it to fall to the ground. Using the console command player.additem 40002 1 will place a copy of the battleaxe in your inventory. The word wall in this dungeon may not give you its word.